After demonstrating poor skills in their daily katas, the Turtles convince Splinter that they need a vacation — he agrees, if they can agree where to spend it. Meanwhile, an Alien Tourist/Polarisoid arrives on Earth taking photos of everything — and everything he takes a photo of disappears right into his camera, to be viewed by family and friends back home on Polaris. Calls are flooding into Channel Six News — even City Hall is missing and April sets out to get an exclusive. At the Technodrome, Shredder and Krang realize that if they could get hold of the Polarisoid’s camera they could rid themselves of the Turtles once and for all. While April is at Fountain Square she does not find her story but she does see the Polarisoid. She is about to “roll tape” when Shredder arrives. April contacts the Turtles and then witnesses Shredder photographing the Polarisoid along with Rocksteady and Bebop. Suddenly, they are sucked into the camera. Now April realizes what has happened to all the missing people and buildings. Before Shredder has a chance to return to the Technodrome, the Turtles arrive. He is about to “take their picture” when April kicks over a trash can that sends Shredder into the fountain and the Polarisoid camera to the ground. 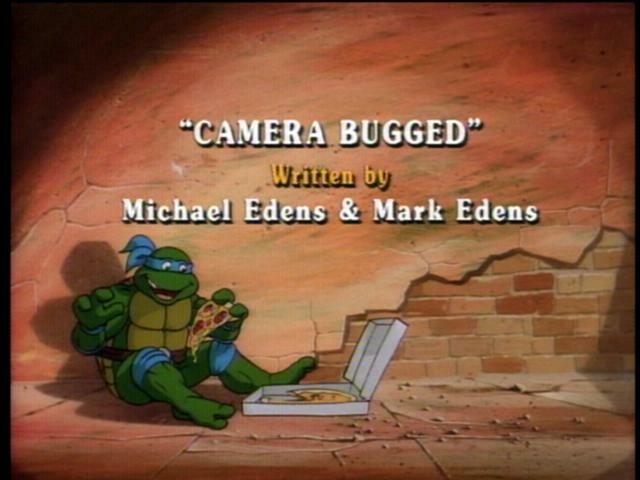 April videotapes the altercations between Shredder and the Turtles for the 11:00 o’clock news when she is knocked down by Shredder, causing her to drop her camera. Shredder grabs what he believes to be the Polarisoid camera and discovering that it does not work, escapes. April explains everything to the Turtles and now knowing that she has the real Polarisoid camera, “hot foots it” over to Channel Six News with her exclusive footage while the Turtles retreat from the sound of approaching police sirens. A short while later, Krang learns of Shredder’s mistake and sends him back to the surface to get the real camera. Meanwhile, Channel Six News “airs” the Polarisoid’s videotape and the Turtles, having recognized Rocksteady and Bebop, realize that April has the Polarisoid camera. At Splinter’s suggestion, the Turtles hurry to Channel Six News. But Shredder arrives first, demanding the return of “his” camera. April still does not know about the switch and defends herself. When the Turtles comes to her rescue and engage Shredder in combat, April decides to videotape it. Leonardo tries to stop her but is too late. While April contacts Splinter for help, the Turtles chase Shredder through a series of “photographs” inside the camera. Back at Channel Six News, in an editing bay, Splinter runs the Polarisoids’ tape and pauses on a scene of a boat in the ocean. With his stave, he breaks the monitor, causing water, and eventually the Turtles and the Polarisoid to come flooding out. Splinter and the Turtles wish the Polarisoid a fond farewell as they return his camera. The Polarisoid suggests that maybe next time he will just buy picture postcards.